Program director, a full-time faculty position in the Department of Hospitality and Tourism Management (HTM) at the Universities at Shady Grove. Click here for more information. Full-time events manager, front of house manager, host, and food runner needed at RIS, an upscale neighborhood restaurant serving seasonal American food, run by executive chef and owner, Ris Lacoste. For more information click here. Gladys Abi-Najm and her four siblings were honored by the National Restaurant Association at its March 27 gala in DC with its 2019 Faces of Diversity Award. For nearly forty years Gladys and her family have been actively giving back to the community as well as providing their Lebanese Taverna employees with opportunities to achieve their American Dreams. Amy Brandwein's Centrolina has been nominated for the 2019 RAMMY award for best Upscale Casual Restaurant of the Year AND Ruth Gresser's Pizza Paradiso, DuPont Circle, was nominated for the 2019 RAMMY award for best Beer Program of the Year. Votes for your favorites in these categories can be cast at www.nbcwashington.com/RAMMYS through Tuesday, April 30 at 5:00 p.m. The winners will be announced at the Restaurant Association of Metropolitan Washington's Sunday, June 30 black-tie gala. Paula Shoyer's article "This Passover Enjoy a Lightened Up Menu That Doesn't Blow Your Diet" appeared in the April 8 edition of The Washington Post's Food section. Janet Yu's Hollywood East Cafe dim sum was singled out, with an accompanying photo, in the Weekend section of The Washington Post as Nightlife reporter Fritz Hahn's top brunch choice in the DMV. ​Cathy Barrow's new book, Pie Squared: Irresistibly Easy Sweet & Savory Slab Pies (Grand Central Publishing), is a finalist for the Baking and Desserts category of the James Beard Foundations Book Awards. Cathy is clearly on a roll! Her first book, Mrs. Wheelbarrow's Kitchen was the IACP Award Winner for Best Single Subject Cookbook in 2015! Amy Brandwein, chef of Centrolina, her restaurant in DC's City Center, is a finalist for the Best Chef Mid-Atlantic from the James Beard Foundation. The JBF Gala awards ceremony will be held Monday, May 6, at the Lyric Opera of Chicago. Pati Jinich has been nominated for a Daytime Emmy Award for Outstanding Culinary Host. https://emmyonline.tv/2019-daytime-emmy-awards/nominees-performer-non-drama-2019-daytime-emmy-awards/. Also, " Pati's Mexican Table" is a James Beard Foundation finalist for its Broadcast Media Award of best Television Program, in Studio or Fixed Location. 2019 JBF Media Awards will take place on Friday, April 26, at Pier Sixty at Chelsea Piers in New York City. Susan Soorenko is finally opening her Ellicott City Moorenko's Ice Cream at 8054 Main Street in April. The opening was delayed because of the flooding in Ellicott City last year. Susan will also have a shop within a shop (Serendipity and More on Prince Street) in Frederick later this Spring. Susan Barocas wrote an article, "Walking Distance to Everything," for the Washington Post Travel Section's March 17 edition. The story described the walking accessibility of New Haven, Connecticut's rich food, culture and history scenes. Domenica Marchetti's story in the Washington Post Food Section on March 13, "It Takes Some Time but you too can Ragu," describes how to achieve the delicious complexity of the long-simmered Italian sauce. Tambra Raye Stevenson was accepted into American University's School of Communications PhD program in Fall 2019 with a merit award working with the AU Game Lab. Also Tambra's WANDA session proposal, "Gaming for Development: Using the Power of Games to Achieve the Sustainable Development Goals" was accepted for the 2019 World Bank/IMF Spring Meetings in April. We hope you can join us for this delicious and informative session on March 24th. Tickets must be purchased in advance. Details below. 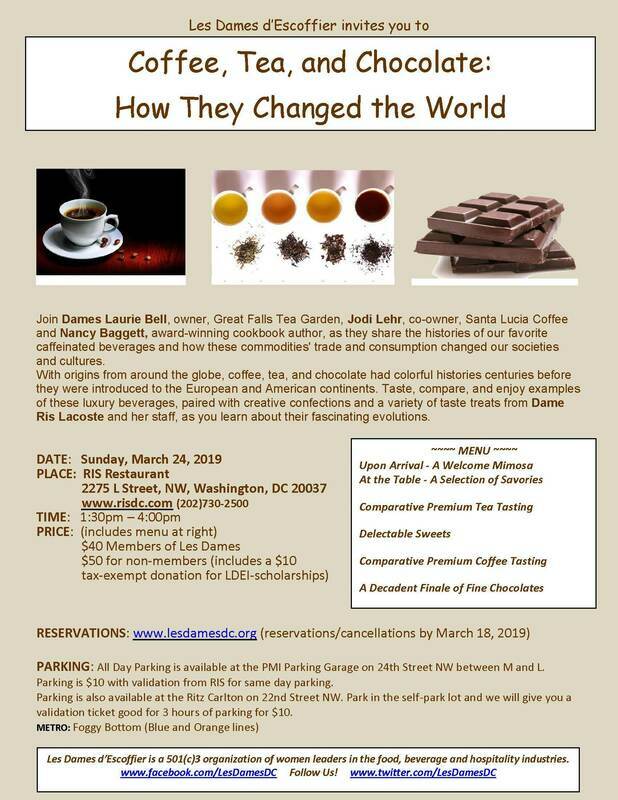 Join Laurie Bell, owner, Great Falls Tea Garden, Jodi Lehr, co-owner, Santa Lucia Coffee and Nancy Baggett award-winning cookbook author, as they share the histories of our favorite caffeinated beverages and how these commodities' trade and consumption changed our societies and cultures. With origins from around the globe, coffee, tea, and chocolate had colorful histories centuries before they were introduced to the European continent. Taste and enjoy examples of these luxury beverages, paired with creative confections and a variety of taste treats from Ris Lacoste and her staff, as you learn about their fascinating evolutions. TIME: 1:30 to 4:00 p.m.
Amy Brandwein is a semifinalist for the James Beard Foundation's Best Chef Mid-Atlantic. Nominees have been chefs for at least five years, worked in their respective regions for at least the past three years and set new or consistently excellent standards. The finalists will be announced on March 27 by the 2018 JBF Best Chef Hugo Ortega at his eponymous Houston restaurant, Hugo's. Ruth Gresser has been nominated as Outstanding Restaurateur by the James Beard Foundation. Candidates have demonstrated high national standards in restaurant operations and entrepreneurship; they must be working restaurateurs who have been in the business for at least 10 years and cannot have been nominated for the award in the past five years. Ruth also was featured in the March issue of Bethesda Magazine for the opening of her newest Pizzeria Paradiso location in DC's Spring Valley neighborhood. DC PITCH FEST - Saturday, March 9 - Dames and Public Welcome! IT'S A "SHARK TANK" FOR FOODIES! Don’t Miss Out! Tickets Are Selling Fast. Be part of the audience as a slate of ten women chefs, authors, culinarians, innovators and entrepreneurs will have a Shark Tank opportunity to present their ideas to a panel of professional experts as Les Dames d'Escoffier's DC Chapter presents Pitch Fest, Saturday, March 9. Join the fun! Enjoy brunch, network with dynamic women in the food industry. Gain valuable feedback and access to resources to help you succeed and grow. All participants will have an opportunity to build lasting connections and benefit from the give-and-take. Aviva Goldfarb, marketing executive and founder of "The Six o' Clock Scramble" will moderate the panel that will include Stacey Adams, president and founder of Annapolis' Tastings Gourmet Market; Susan Callahan, chef and lecturer at University of Maryland Eastern Shore, and Jill Collins, founder of hospitality PR firm Jill Collins Public Relations Group. The brunch and presentation experience will be held at Mission Navy Yard from noon until 3 pm. Tickets, at $35 including brunch, click here for your tickets. Please note, reservation and cancellation deadline is March 6, 2019. ​Nancy Baggett presented a well-received workshop, "Successful Lavender Culinary Products," to more than 100 attendees on January 25 at the bi-annual U.S. Lavender Growers Convention in Charleston. She provided tastings samples of a dozen potential gift shop products ranging from Lavender-Infused Balsamic Vinegar and Lavender-Pear Preserves to Lavender-Herb Popcorn and Pineapple-Red Sweet Pepper Chutney with Lavender. All were a hit. Amy Brandwein will open Piccolina (little one in Italian) market and café next summer across Palmer Alley from her award-winning Centrolina restaurant. She plans to serve omelets, breakfast crepes, crostatas and eggplant lasagna at Piccolina which also will be outfitted with a wood-fired oven for a new bread program. Centrolina's market will move over to Piccolina to give the mother restaurant more dining and event space. CiCi Williamson will give her Downton Abbey food history presentation at an LDE-Houston chapter's fundraiser on Tuesday, February 5. 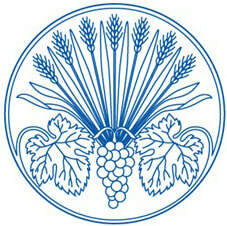 ​CALL FOR NEW MEMBERS! Nominations due February 15. Please consider nominating qualified colleagues and acquaintances who will bring their enthusiasm, talent, and ideas as active members to our Les Dames d 'Escoffier DC chapter. Later this week, a new online, fillable application will be available on the public section of the LDEI-DC Chapter website and an invite with links will be sent to nominees. Those completed applications will be due March 1.